Leaves color green and turn to red in autumn, in round shape with lobes. Leaf stalk edible (without the peel) in the color green. 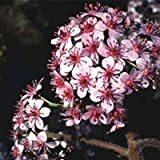 Flower color pink with five petals and flowers grow in clusters in shape of ball on stems.